What is Comedonal Acne and How to Get Rid of It? Comedonal acne is a certain type of acne in which most of the scars are found to be ‘comedones’. This is a very mild form of acne that comes with little to no inflammation. Though the reasons lying behind the comedonal acne can be different in different cases, the basic cause remains the same always, which is nothing but the hormonal imbalance followed by the overproduction of our oil glands. It has been seen that most of the comedonal acne occur on chin and forehead areas. Blackheads: Blackheads are non-inflammatory black spots (sometimes yellowish), which are mostly visible in our ‘T-Zone’ (the ‘T’-shaped area of the face including the forehead, the nose and the chin). There are times when our skin pores get clogged by dirt, excess oil or sebum, bacteria, etc. If these clogged skin pores get in touch with the oxygen present in the atmosphere, they turn ugly black spots. Whiteheads: As the name suggests, whiteheads are small white spots found on our skin. Generally, the sebaceous glands present in our skin secrets sebum for keeping our skin moist. But when the sebum remains underneath the external layer of the skin instead of coming out on the surface, we develop comedonal acne which look just like white spots on the skin. Make it a habit to cleanse your skin at least twice a day. Cleansing keeps the skin pores free from excess oil, dirt, grime and bacteria, which eventually gives us a squeaky clean skin with little to no comedonal acne. Choose your makeup wisely. There is no point in using cosmetics loaded with harmful chemicals as they simply clog our skin pores and prevent the skin from breathing. Also, make sure that you remove your makeup every day before sleeping. Opt for skin care products containing salicylic acid. Being one of the most effective acne remedies, this acid can turn out to be the real savior. You can easily avail facial foams and face washes with salicylic acid in your local medical stores. 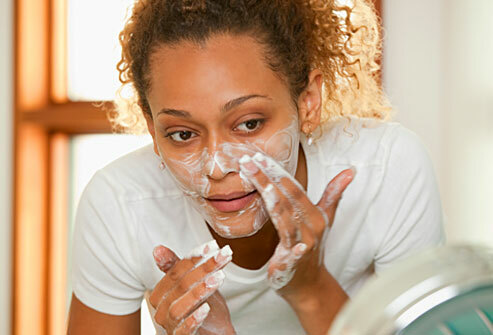 Try OTC acne-fighting creams, especially the ones meant to treat blackheads and whiteheads. With so many well-known beauty brands available in the market, finding a reliable product will not be a tough task. Finally, talk to a dermatologist. Your comedonal acne might be a result of the acute hormonal imbalance that you have been suffering from. Only an expert can figure out the actual cause of the problem. So, consult with a professional.